The owners of Alaska’s five large metal mines – Sumitomo Metal Mining Pogo, Hecla Mining Co., Kinross Gold Corp., Teck Resources Ltd. and Coeur Mining Inc. – accounted for nearly half of the US$96 million of exploration spending in the state during 2014. This year, similar investments by these large companies and other majors are again providing solid footing for the Far North state’s mineral exploration sector. 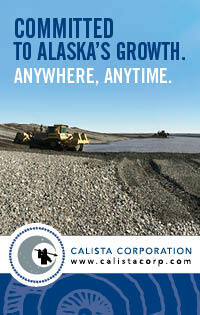 Avalon Development Corp. President Curt Freeman said he is seeing more mining majors shopping for deals in Alaska. “The junior markets are still flat, but that plus-three-year slump in the junior explorer market has caused joint ventures and leases and mining claims to unravel, providing well-heeled producers with opportunities to acquire at the bottom of the market. Expect to see more producers become involved in Alaska’s mineral industry this year,” the longtime Alaska geologist predicted. Sumitomo Metal Mining Pogo – a joint venture between Japanese firms Sumitomo Metal Mining Company (85 percent) and Sumitomo Corp. (15 percent) – accounted for nearly 20 percent of the exploration spending in Alaska during 2014 and 2015. Following up on the US$17 million exploration program in 2014, the Japan-based owners of the Pogo Mine invested US$15 million on discovering and expanding zones of high-grade gold that are adding years to the life of the Interior Alaska mine. “This funding shows the tremendous confidence that Sumitomo has in the Pogo deposit and our ability to find additional resources for many years to come,” said Lorna Shaw, external affairs manager, SMM Pogo. Based on the high-grade gold discoveries made in the immediate mine area over the past five years, this confidence is well-founded. In addition to the robust exploration in the immediate mine area, the Sumitomo partners continue to seek other high-grade gold deposits in the broader Goodpaster Mining District where Pogo is located. Stone Boy Inc., owned by subsidiaries of Sumitomo Metal Mining (95 percent) and Sumitomo Corp. (5 percent), has been exploring this area for other high-grade gold deposits since 1991. Over the past three years, the Ink claims, located about 15 miles (24 kilometers) southeast of Pogo, has been the primary focus of this search, including a US$1.3 million program completed in 2014. Millrock Resources said it has formed a strategic partnership with a major mining company to explore for high-grade gold deposits in Alaska. While the name of this strategic partner is currently being withheld, Millrock said the gold miner is new to the state, further shrinking the field of candidates. Millrock and its yet-to-be-named strategic partner furthered its search for high-grade gold deposits through the acquisition of an extensive, proprietary database of geological information from nearly two decades of exploration Anglogold-Ashanti and International Tower Hill Mines carried out in the Goodpaster Mining District where the Pogo Mine is located. The company acquired the geological data from Corvus Gold Inc., a spin-out company formed to explore International Tower Hill’s non-Livengood assets. Millrock also purchased West Pogo, a gold property located about two miles (three kilometers) west of Sumitomo Metal Mining Co.’s Pogo Mine, from Corvus along with right of first refusal to acquire LMS, another gold project in the area. New on the Alaska exploration scene, Royal Gold Inc. has agreed to invest up to US$30 million in furthering the exploration and potential development of Contango Ore Inc.’s Tetlin gold properties situated along the Alaska Highway near the crossroads community of Tok in eastern Alaska. In return, the Denver-based royalty company will earn up to a 40 percent interest in Peak Gold, a joint venture that will hold the 676,200 acres of Native owned lands Contango leased from the Tetlin Village Council and some 83,720 acres of state of Alaska mining claims staked adjacent to the Tetlin lease. While this extensive land package blankets numerous precious and base metal targets ripe for exploration, the Peak zone, a gold-rich skarn deposit located on the Tetlin lease, is currently the property’s most advanced asset. Early in 2014, Contango published a maiden indicated resources of 6 million metric tons averaging 3.46 grams of gold per metric ton, 11 g/t silver and 0.25 percent copper for 783,115 gold-equivalent ounces. Additionally, the skarn deposit has an inferred resource of 3.9 million metric tons averaging 2.07 g/t gold, 14.28 g/t silver, 0.23 percent copper for 332,969 gold-equivalent ounces. For 2015, Royal Gold committed US$5 million to a phase-one exploration program that tested some the blue-sky potential of the expansive Tetlin property. This included some 7,500 meters of drilling at a number of outlying targets – Tars, Saddle, North Saddle and Saddle Skarn – as well as below the Peak zone. “While the joint venture has not received all assays back from the phase 1 drilling, initial findings are encouraging,” Contango Ore President and CEO Brad Juneau reported in early September. Results from the initial exploratory drilling were encouraging enough for Royal Gold to invest another US$4 million towards a 6,000-meter drill program during the fall of 2015. Northern Empire Resources Corp., another new Alaska explorer, was formed as a restructuring of Prosperity Goldfields late in 2014. The company’s portfolio of early-stage gold properties in Alaska and Nunavut includes the Richardson property about 45 miles (70 kilometers) west of Pogo. Early in 2015, Northern Empire optioned Hilltop, a portion of the larger Richardson property, to Sonoro Metals Corp.
Northern Empire and Sonoro said that an initial round of exploration has confirmed and expanded the footprint of known gold mineralization at Hilltop. Highlights from the program include channel samples returning up to 19.45 g/t gold and rock grab samples grading as high as 26.55 g/t gold. Kinross Gold Corp. continues to seek deposits that can extend the life of its Fort Knox Mine about 25 miles (40 kilometers) north of Fairbanks. According to an updated mine plan published this year, Fort Knox has enough higher grade reserves to feed the mill into 2017 and lower grade ore to stack on the heap leach pad into 2019. Kinross invested roughly US$7.8 million on exploration at its Interior Alaska properties in 2014 and continued this work with a similar scale program this year. This work is focused on upgrading measured and indicated resources immediately surrounding its Interior Alaska gold mine; continued exploration of Gil, a deposit located roughly five miles east of the mill; and exploration of Gilmore, a potential pit expansion area on previously restricted federal lands immediately west of the Fort Knox pit. Kinross is also carrying out early-stage exploration on a large block of claims in the Circle Mining District about 80 miles (130 kilometers) north of Fort Knox. Freegold Ventures Ltd. has outlined a 6-million-ounce bulk-tonnage gold deposit on its Golden Summit property located just four miles (seven kilometers) north of the Fort Knox mine. This year’s work at Golden Summit is focused on completing a preliminary economic assessment that investigates the viability of a two-phase development plan that starts off with a heap leach operation to recover gold from a near-surface oxide resource with the potential of adding a mill to process the sulfide resource that lies beneath oxide ore.
Freegold’s 2015 exploration program, meanwhile, focused on Shorty Creek, a copper-gold porphyry project in the Livengood region of Interior Alaska. Following the acquisition of Shorty Creek in mid-2014, Freegold completed an initial pass of geophysical and geochemical surveys; and staked 5,200 acres of additional claims, increasing the project area to 20,920 acres. This year, Freegold put together a 3,000-meter drill program to test two significant porphyry targets it has identified on the property. International Tower Hill Mines Ltd. budgeted US$10 million for metallurgical, field and engineering work aimed at optimizing its mine plan for the 20-million-ounce Livengood gold project located about three miles (five kilometers) north of Shorty Creek. 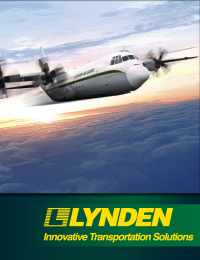 A feasibility study completed for Livengood in 2013 anticipates a 100,000-ton-per-day mill churning out 8.1 million oz. of gold over an initial 14-year mine life. Since the completion of the feasibility study, Tower Hill has been investigating opportunities to lower the capital and operating expenditures for mining the large but low-grade deposit at Livengood. Evaluating the ideal size for the mill, steepening the pit slope in the early years and improving head grades with more thorough metallurgical sampling are some of the areas where the company believes it can improve the economics of developing Livengood. About 45 miles (70 kilometers) southwest of Livengood, Endurance Gold Corp. continues prospecting and sampling aimed at prioritizing drill targets at its Elephant Mountain gold project. Hecla and Coeur – owners of Southeast Alaska’s two large mines – accounted for more than US$10 million of mineral exploration on the panhandle in 2015. At US$8.2 million, Hecla’s exploration at Greens Creek was the largest program along this metals-rich panhandle. This robust exploration program is continuing to discover and delineate silver-rich volcanogenic massive sulfide mineralization at the lower Northwest West, Deep 200 South, Southwest and Gallagher Fault Block of the underground mine at Greens Creek. Highlights include: 6.0 feet grading 107.3 ounces per short ton silver, 0.73 oz/t gold, 4.0 percent zinc and 2.1 percent lead at the NWW zone; and 6.2 feet averaging 61.9 oz/t silver, 0.04 oz/t gold, 2.1 percent zinc, and 1.3 percent lead at Deep 200 South. In addition to underground drilling, Hecla tested Killer Creek, an exploration target about a mile west-northwest of the mine, and High Sore, a prospect less than a mile southeast of the mine, with a 3,000-meter surface drilling program. Coeur Mining is reaping the benefits of its recent exploration at its Kensington mine. “Our recent success identifying high-grade mineralization near existing Kensington infrastructure has added higher-margin production to our mine plan and significantly improved the expected economics of the mine,” Coeur Mining President and CEO Mitchell Krebs explained. The highest grade portion of this newfound gold is located in the area of the historic Jualin Mine, which is situated about 8,250 feet from current mining in the Kensington Mine area. Since late 2013, surface drilling has outlined 289,000 tons of inferred resource at Jualin averaging 0.619 oz/t (179,000 oz) gold, nearly triple the grades currently being mined. This higher grade resource has been incorporated into a new mine plan that anticipates higher-grade Jualin material supplementing ore from the Kensington side of the mine by 2017. For 2015, Coeur dialed back its exploration at Kensington to US$2.2 million as it begins underground development to reach the high-grade Jualin deposit. At the northern end of the Southeast Alaska Panhandle, Dowa Metals & Mining Co. Ltd. invested another US$5 million on expanding the Glacier Creek volcanogenic massive sulfide deposit at Constantine Metal Resources Ltd.’s Palmer project. In May, Constantine published an inferred resource of 8.125 million metric tons averaging 1.41 percent (252.6 million pounds) copper, 5.25 percent (940.4 million lbs.) zinc, 0.32 grams per metric ton (83,600 ounces) gold and 31.7 g/t (8.3 million oz.) silver for Palmer. This is nearly double the previous resource calculated for the Glacier Creek deposit in 2010. This year, Dowa and Constantine focused on expanding the deposit down into an area where the geological and geophysical evidence points to the potential of a copper-rich core of the VMS deposit. At the southern end of the Southeast Alaska Panhandle, Ucore Rare Metals Inc. is finalizing a feasibility study for its Bokan rare earth element project on Prince of Wales Island. Early in 2015, the company published the results from a 4,000-meter infill and resource expansion program at the Dotson Ridge deposit at Bokan. This drilling increased the indicated resource by 63 percent to 4.79 million metric tons averaging 0.6 percent (63.54 million pounds) total rare earth oxides. Additionally, the deposit has 1.05 million metric tons of inferred resource averaging 0.6 percent (13.96 million lbs.) TREO. Roughly 39 percent of the TREO in both categories are the higher valued heavy rare earths. In addition to putting the final touches on a feasibility study, Ucore has been working with Utah-based IBC Advanced Technologies to develop a new method of separating rare earths using molecular recognition technology, a process that designed to bind selectively with ions based on multiple parameters such as size, chemistry, and geometry. Ucore believes the exploration and development of its heavy rare earth-enriched Bokan Mountain project, alongside the cutting-edge REE refining technology separates it from other rare earth-focused companies in North America. From Red Dog to grassroots gold exploration, NANA Corp., the Alaska Native regional corporation that represents the Iñupiat of Northwest Alaska, is involved in a number of mining initiatives across its traditional homeland. NANA owns the land where Red Dog zinc is located and is a partner in the mining of the world-class zinc mine. Teck Resource Ltd., the operator of Red Dog, continues to add years to the mine by upgrading high-grade resources in nearby deposits to reserves and seeking out new deposits in the larger Red Dog area of Northwest Alaska. Going into 2015, Red Dog had 45.4 million metric tons of ore in reserve averaging 15.8 percent (6.05 million metric tons) zinc, 4.1 percent (1.86 million metric tons) lead and 72.6 grams per metric ton (106 million ounces) silver. This includes the first-ever reserves of 7.4 million metric tons averaging 24.7 percent zinc and 6.9 percent lead for Qanaiyaq, a near-surface deposit that lies to the south of the mined out Red Dog main deposit. In addition to adding to the reserves on NANA lands, Teck is exploring prospective state lands in the larger Red Dog district. Anarraaq-Aktigiruq, situated roughly eight miles (13 kilometers) northwest of the current operations, is among the highest quality of these outlying targets. The diversified miner also holds a 50 percent stake in Lik, another Red Dog District zinc project that is being advanced by Zazu Resources Ltd. According to a preliminary economic assessment published in 2014, a 5,500 metric-ton-per-day mill processing ore from an open pit mine at Lik would produce an average of 234,000 dry metric tons of zinc concentrate and 55,800 dry metric tons of lead concentrate annually over an initial nine-year mine life. Zazu’s 2015 work program at Lik includes the continuation of acid rock drainage and environmental baseline studies needed for permitting. About 180 miles (290 kilometers) southeast of Red Dog, NovaCopper invested US$5.5 million on a work program focused on advancing a pre-feasibility study for the development of an open-pit mine at the Arctic volcanogenic massive sulfide project in the Ambler Mining District. This work included resource confirmation and geotechnical drilling, as well as engineering and environmental studies. Arctic is the most advanced of the Upper Kobuk Mineral Projects, a partnership between NovaCopper and NANA. In addition to its partnered projects, NANA is seeking the lode source of the some 350,000 ounces of placer gold recovered from the Fairhaven Mining District. Following up on systematic prospecting and sampling carried out in recent years, the Alaska Native regional corporation completed roughly 4,000 meters of drilling on its gold prospects in the area. Southcentral Alaska is known to host deposits rich in gold, copper, nickel, tungsten and tin. This region stretching south of a large portion of the Alaska Range, however, saw little in the way of mineral exploration during 2015. Kiska Metals Corp. sold Whistler, a Southcentral Alaska copper-gold project that was once considered the company’s flagship asset, to Brazil Resources Inc.
Whistler is anchored by its namesake deposit, which hosts 79.2 million metric tons of indicated resource grading 0.51 grams per metric ton gold, 1.97 g/t silver and 0.17 percent copper; and 145.8 million metric tons of inferred resource averaging 0.40 g/t gold, 1.75 g/t silver and 0.15 percent copper. Some 20 other prospects and deposits have been identified across the roughly 65-square-mile Whistler property, including those found at Whistler orbit, Island Mountain and Muddy Creek. 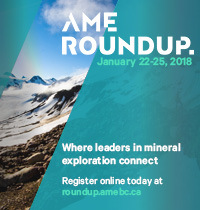 “The Whistler deposit is one of several porphyry centers (Raintree West, Raintree East, Rainmaker and Island Mountain) identified on the property, and future exploration programs will focus on developing a better understanding of their size potential,” explained Brazil Resources CEO Garnet Dawson. Kiska, meanwhile, is continuing to explore Southcentral Alaska. First Quantum Minerals Ltd., a global mining company with a particular focus on copper, is funding exploration of the project generator’s Copper Joe copper-gold-molybdenum project situated about 20 miles southwest of Whistler. Under an option agreement signed in 2014, First Quantum can earn an initial 51 percent interest by investing US$5 million at Copper Joe by the end of 2017, a stake that would increase to 80 percent if the copper miner decided to build a mine there. After signing the deal last August, First Quantum drilled two holes at Copper Joe late in 2014. While this initial program did not return significant copper and gold assay results, the confirmation of a strong porphyry-hydrothermal system was enough to pique the interest of the global miner. To identify areas to conduct a follow-up drill program, First Quantum invested US$826,000 in an early 2015 program that included geological mapping and a magnetotelluric geophysical survey at Copper Joe. Strongbow Exploration Inc. picked up two Alaska tin properties from Osisko Gold Royalties Ltd. during 2015, including the Coal Creek property in Southcentral Alaska. Coal Creek was staked for its tin-silver potential by Houston Oil and Minerals in 1980. Based on about 5,000 meters of drilling, an historical resource of 4.4 million metric tons averaging 0.27 percent tin was calculated for Coal Creek, according to data published by the U.S. Geological Survey. Tungsten and gold also have been identified at Coal Creek. Choice grab samples collected from the property in 1990 turned up 720 g/t tungsten, 65 g/t silver, 0.5 g/t gold and 4.86 percent zinc. Sleitat, the other tin property picked up by Strongbow, is located in Southwest Alaska about 40 miles (65 miles) west of Northern Dynasty Ltd.’s Pebble copper-gold-molybdenum project. In 1989, the U.S. Bureau of Mines estimated the Sleitat prospect to contain 25.9 million tons at average grades of 0.22 percent to 0.37 percent tin, 0.04 percent tungsten and 17 grams per metric ton silver. The Sleitat and Coal Creek resource estimates do not meet the rigor of NI 43-101 standards. 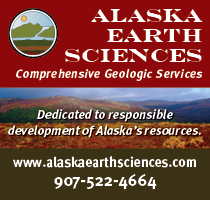 The recent slowdown of mineral exploration in Southwest Alaska continued into 2015. The Alaska Peninsula that stretches off this region into the Pacific Ocean, however, was a target of increasing activity this year. Redstar Gold Corp. got the ball rolling with a 1,500-meter drill program at its Unga gold project, which blankets two parallel trends of high-grade epithermal gold veins that each extend for more than 4.5 miles across the southeast corner of Unga Island. The Apollo-Sitka trend is home to the historic Apollo and Sitka mines, which produced some 150,000 ounces of gold from high-grade veins on the Apollo-Sitka trend between 1891 and 1922. This year’s drilling, however, targeted the Shumagin Trend, which lies about two miles northeast of Apollo-Sitka. In 2000, SRK Consulting calculated a non-NI 43-101-compliant resource of 254,000 metric tons averaging 27.4 g/t gold and 127 g/t silver for a segment of the Shumagin Trend known as the Shumagin prospect area. The first four holes drilled this year, which targeted various structural elevations of the Shumagin vein system within the resource area, cut high-grade gold mineralization where expected. Hole 15SH011, the first hole of this confirmation drilling, cut 1.9 meters grading 5.89 oz/t gold and 2.4 oz/t silver. Redstar interim CEO Ken Booth told Mining News that the holes drilled during phase 1 proves that there is continuity of structure and very high-grade gold. “If (Redstar) or somebody else wants to tighten up that area and starts to work towards a resource – measure and indicated or inferred – there is a very good chance the drilling is going to produce similar results,” he said. The remaining four holes hit gold beyond the resource area. This year’s drilling, along with past drilling, has outlined an area of high-grade gold mineralization at the Shumagin prospect for roughly 500 meters along strike and about 330 meters of depth. Redstar said trenching in this area has shown the vein system extends for at least 1,200 meters. First Quantum minerals funded a US$2 million program for further exploration at Millrock Resources’ aptly named Alaska Peninsula project in 2015. Millrock came by this 500,000-acre highly prospective land package through an exploration and option-lease agreement signed with the Bristol Bay Native Corporation in 2012. After funding a US$600,000 reconnaissance program in 2014, First Quantum entered into an option to earn up to an 80 percent joint venture interest in the property. Results from this initial work, intrigued First Quantum enough to take up the option and fund a 2,400-meter drill program aimed at investigating what lies below the surface at two the most promising prospects – Dry Creek, formerly known as Bee Creek, and MDB, short for Mallard Duck Bay. Historical exploration, along with sampling completed by Millrock and First Quantum, has outlined an area of zoned mineralization at Dry Creek that covers roughly 3,000 acres. Situated roughly 20 miles (32 kilometers) south of Dry Creek and about three miles south of the local community of Chignik Lagoon, MDB hosts a large alteration zone that was first recognized by prospectors at the turn of the 20th Century. “MDB is … is a huge alteration system, but there doesn’t appear to be a lot of base metals at surface,” Beischer told Mining News. Beischer said this lack of metals at surface, coupled with the enormous size of the alteration system, made MDB a challenging prospect for previous explorers to target with drilling. Millrock, however, is up to the challenge of tackling the huge alteration system, which could be the surface expression of a porphyry ore body waiting to be discovered, he added.